Ideal for both beginners and pros – and everyone in between – Bike Lane Pro bicycle trainer is one of the best choices for you. Fits bikes with quick release rear axle and with features that allow adaptability to uneven floors; this might be the best choice for you! 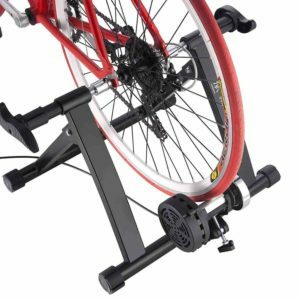 This bike trainer offers five levels of resistance from the starting point, ideal for different kinds of practice. It works with magnetic technology, which means it is a nearly silent option for your indoor cycling all day long, all year round. 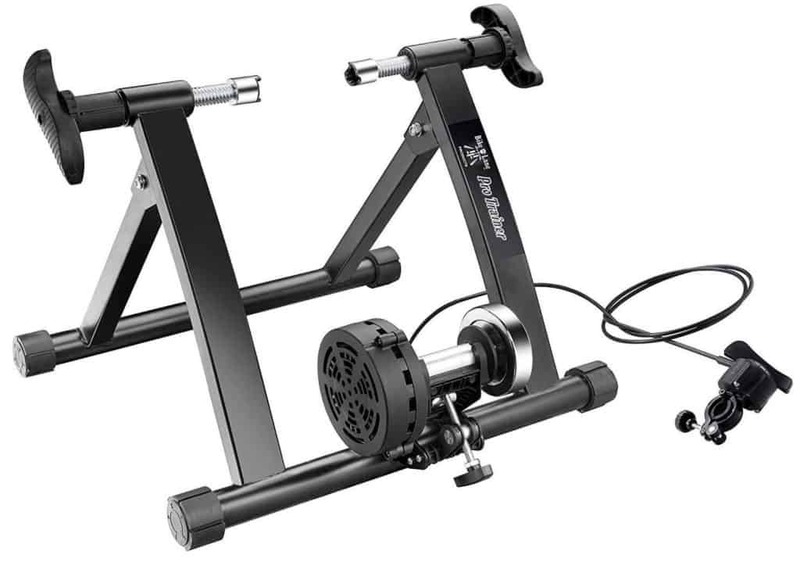 You can expect a smooth and quiet training session when using the bike lane pro trainer, and its wide legs and sturdy frame provide enormous stability, which makes this product a common choice for the pro cyclists. It can give you the feel of road cycling due to its outstanding stability – with added legs to help it – and it is wonderfully portable and light, which means easier storage and the possibility to carry it with you when traveling. The materials are reliable and sturdy, giving this trainer a long lifespan. 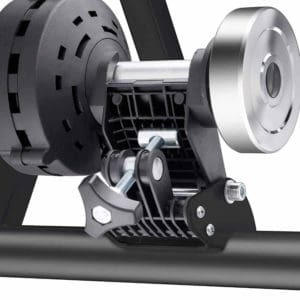 This product also provides a natural pedal feel due to its machined steel flywheel, and it fits 700c or 27 inches road wheels or 26 inches mountain wheels with different tire sizes with a quick release skewer, the fact that makes the bike lane pro trainer a flexible and reliable source for training. Regarding its size, 15.75″ x 18.5″ x 21.5″, it must be mentioned as a way for you to understand how portable and storable this product is. When buying it, the riser block is included. This indoor trainer has many incredible features that make it one of the best choices for different types of training. It is considered state of the art, due to its magnetic resistance that can be achieved from the starting point. When mentioning the magnetic feature, it is impossible not to talk about how quiet this option is for you, allowing you to train whenever you feel like doing some exercise or training. The portability is undoubtedly a plus too, shall you want to carry it in your travels, perhaps to do some pre-race warm up. The fantastic stability and great durability are incredible also, and the versatility allows you to pick the kind of training you need to do, and change it according to your goals. This product was designed to optimize your use of it, for your comfort and promote a good riding, but not giving up on a low-profile look that will fit great in any home and its environment. The product adaptation to previous owned bikes may be a bit difficult, customers have found, but it is solvable, despite you possibly need to follow instructions. Customers mention the details that aren’t explicit in the product description, such as its effect on thicker tires, which may be a problem, but it is fixable. They are extremely satisfied with its portability, describing the act of bringing the product outside for outdoor training as a quick affair. As mentioned before, the adapting period to your bike may be a bit more complicated than expected. Overall, there is overwhelming customer satisfaction that can’t be ignored. The features included in this product and the outstanding pros offered by it make this product one of the best options for any kind of cyclist and training session they may need, so we are giving it a full five stars with distinction. But there are more bicycle trainers you should learn about.